← Chicken Parm, Clowns And American Pie. How I spent My Saturday Night. 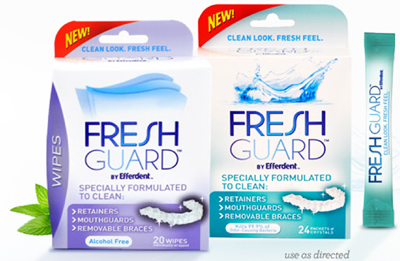 Click here to get a printable coupon for $1 off Fresh Guard Cleaner for retainers, mouthguards, removable braces, and bring it to Rite Aid starting Sunday, March 30th, where you may find this on sale for $5.99. Use your $1 coupon, and you will pay $4.99, and also get a $5 coupon to use on your next visit to Rite Aid. This makes this product free! Note: coupons will run out. If you want this deal, print the coupon now (you can print it twice, and get two of the deals! ).